An Interview with Douglas Brinkley. · One Book. One Author. One Hour. 1:34 – When his book came to be on Booknotes Brinkley was a professor at Hofstra University in Long Island. His on-the-road history class was the subject of this book and had gotten some national attention. 3:33 – He did not really prepare for his appearance on the show, believing as Kerouac did that “first thought, best thought” was the best policy. 6:22 – Brinkley remembers most that this interview was the beginning of his friendship with Brian Lamb. The two have subsequently become good friends. 9:09 – In Brinkley’s experience Lamb asking biographical questions of his guests was unique. He feels that this line of questioning is smart because it taps into people’s inherent interests and biases which affect their worl. He calls this a “topographical” approach. This interest in where someone was from and their biography is mirrored in the approach behind the Majic Bus – American Odyssey course. Brinkley feels that this course could not have happened later because of the connectivity provided by smartphones and the internet which would have made the students more connected to home, and less engaged in the moment. He does not fully support how connected our society has become through technology and is skeptical of things like online learning. 14:43 – There are no drawbacks to the longer format interviews because it gives someone a chance to talk about a book in a public forum. This is the amount of time needed to really talk about your research. Brinkley feels that CSPAN’s archive provides a key to the nation’s past and is a great resource for scholars. 16:26 – There is no question to Brinkley that people are interested in the process of writing because almost everyone believes that they themselves could be an author. Because of this he thinks that it is great that Lamb asks these questions about the process of writing. This information about other authors’ processes also helped Brinkley because before watching Booknotes he thought that he was one of the only people who wrote their books by putting pen to paper. 18:53 – Brinkley thinks that Brian Lamb is the only person working on the television medium who reads the books they discuss in interviews from cover to cover. 19:23 – Brinkley was surprised that Lamb was willing to give him a chance on the show because a lot of the people that he wrote about in his book were counterculture. 21:45 – Brinkley became a great admirer of Booknotes after appearing on the program. He was impressed that Lamb asked short questions, keeping the interview about the interviewee and not the interviewer, as it should be. 23:28 – Brinkley would have absolutely appeared on the show if asked again. He thinks that the one time only rule makes sense because it gives more people the chance to appear on the show. 24:17 – Brinkley thinks that the collection of books along with the interviews themselves are a great resource so that researchers can look at what people were talking about in America in that particular period of time. The non-fiction books help to capture American culture, which will help those doing media studies and more. 25:54 – There was a big bump in sales and national attention for his book following his appearance on Booknotes. CSPAN and the program both have a large audience amongst teachers, the primary audience for this book. Through this appearance the education community of America embraced Brinkley and his work. He continues to get approached about this book and this interview. 28:55 – His appearance on the show made Brinkley realize the power of CSPAN as a network beyond a strict focus on D.C. and politics. He feels that CSPAN does what PBS should have done but failed because CSPAN gives slices of all opinions without edit. 30:18 – Since his appearance on the program Brinkley had written several books, undertaken more Majic Bus and Civil Rights educational bus tours, and begun a six part book series on the National Parks and conservation. 32:31 – The lasting impact of Booknotes is that it showed people that cable television could out-do the PBS model in presenting ideas to the American people in a credible forum. Booknotes became the book club of America. 36:10 – Brinkley thinks that Lamb is a great American figure, much more than just a media figure. Lamb believed in Brinkley and helped his career by allowing him to bring his Majic Bus idea to the people and argue for the importance of hands-on experience in higher education. Lindsey Bestebreurtje (Oral Historian) , “An Interview with Douglas Brinkley.,” One Book. One Author. One Hour., accessed April 24, 2019, http://booknotes.gmu.edu/items/show/2807. 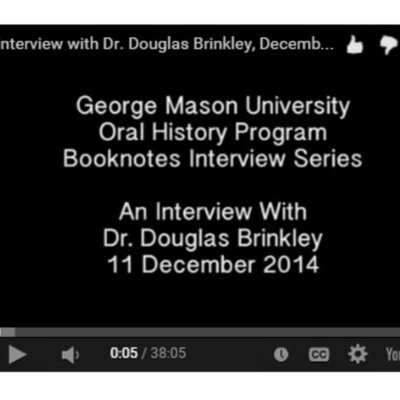 Dr. Douglas Brinkley is interviewed as part of the Booknotes Oral History Project on 11 December 2014. Dr. Brinkley discusses his appearance on C-SPAN's Booknotes program on 18 April 1993, where he discussed his book The Majic Bus: An American Odyssey. Booknotes Oral History Series. R0143 Box 02 File 04.